For my 30th birthday, there was one thing I knew I wanted when people asked, and that, was a new tattoo. I figured 30 was a pretty good milestone, and I want more tattoos, so why not? I was very lucky and my Nanny and G (what I call my Mum's parents), and my Auntie and Uncle gave me money for my birthday. I saved up too, and I knew exactly who I wanted to book in with. A trip to Stockport was in order, to go and see the amazing Lawrence Canham. Stu has previously been tattooed by him twice, we've both fallen in love with his work, and he is a genuinely lovely bloke as well, so it was an easy decision. I had a rough idea of what I wanted, neo-traditional style (which I plan for all my tattoos to be), and inspired by my wedding bouquet. As a surprise for my parents, I also opted to get a yellow rose in the design too, which is what they had in their wedding flowers. 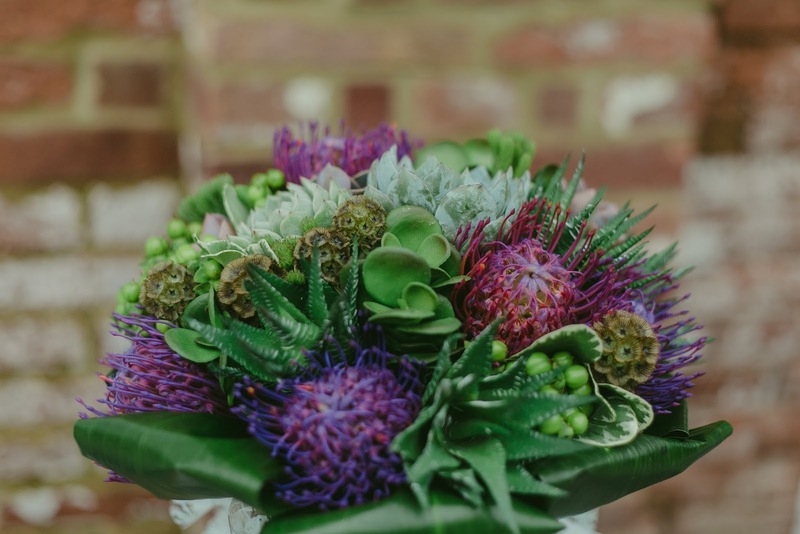 I sent over some photos from the mega ClickClickBang Photography of my bouquet by Fleurations, told Lawrence I wanted it for my shin, and let him come up with the design. I booked in for a full day. I don't like having unfinished tattoos so I was determined to get this done in one sitting. I made sure to bring lots of drinks and sweets with me to keep up my energy, and plenty of crisps for snacking on too. (McCoy's chip shop salt & vinegar crisps are proper mega by the way). I'd told Lawrence that my lower leg was essentially his, so he came up with a design that he could also add to in the future, and off we went! Oh it was a lot of lines let me tell you. I highly recommend that if you decide to have your wedding flowers tattooed on you that you don't have succulents because so many lines. Much ouch. Lawrence did the tattoo in sections rather than lining the whole thing, which was much better for both of us. Meant more switching it up for him, and more of a break for me as colour is easier than line work. 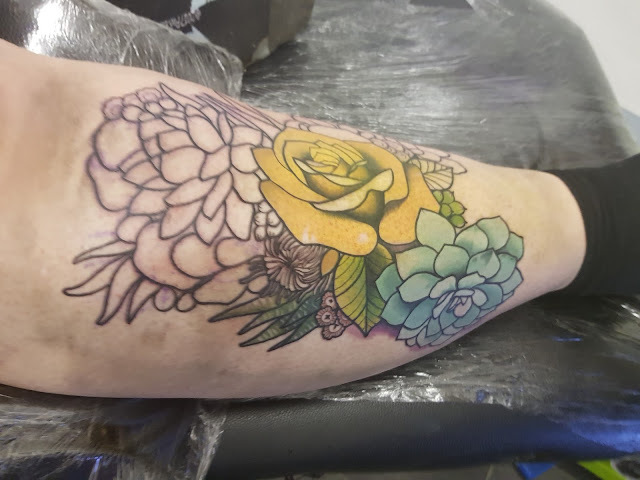 By the time we got the to last bit of the tattoo that needed colour, the succulent under my knee, I was positively miserable. I sat for just over 6 hours and I absolutely will not be sitting for any longer than that ever! My leg was swollen and bruised, so ibuprofen was my friend for a few days after, as well as keeping my leg elevated whenever I could. But the end result... so damn worth it. 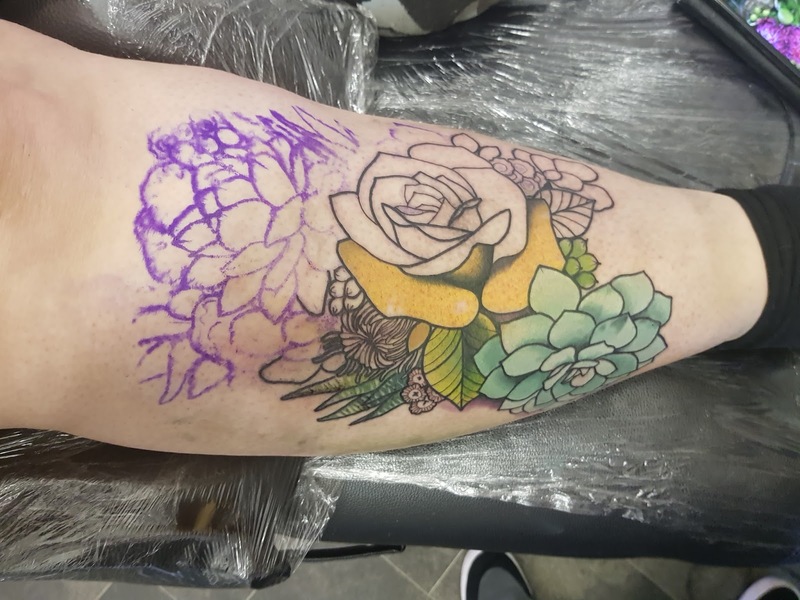 I absolutely love it, and my Mum (who hates tattoos by the way) got quite emotional when I revealed the surprise of my yellow rose to her), which was a total bonus! Here it is now, fully healed and looking magic. I moisturise my tattoos twice a day, every day, and wear sunscreen on them the second the sun starts to appear. Isn't it just lush?! I'm obsessed. And I feel much less wonky now. I already can't wait to add more to it, so I best get saving! I cannot recommend Lawrence enough, he's such an underappreciated talent and I think we'll feel very lucky to have found him now as his profile rockets over the next few years, inevitably giving him an epic waiting list. PS. My other amazing butterfly and moth themed leg is by Keely Rutherford, I still have some space on this leg so need to go back and get it finished with her too! I Had Carpal Tunnel Surgery... Twice : Where Have I Been?